Northwood Park Swim Club dominated relays to defeat Jan Ree 322-160 Thursday, July 13. 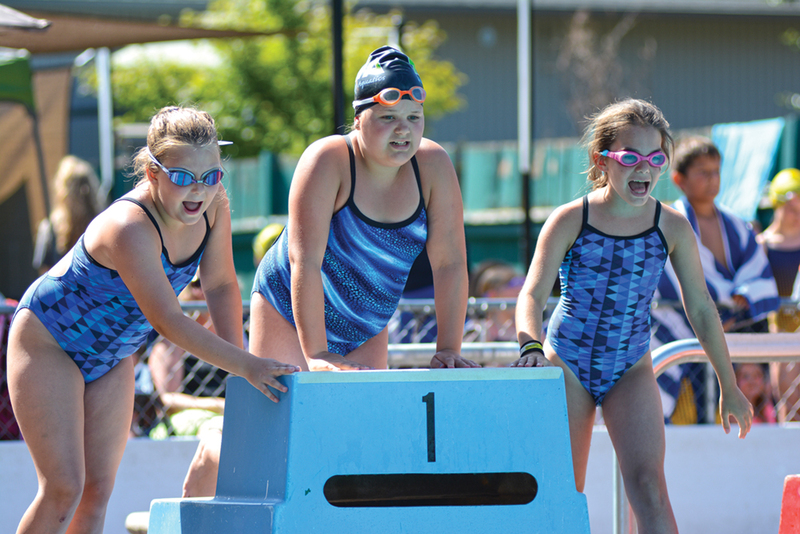 Sayje Castronovo, Kaitlyn Schaffer, Meili Skipper and Kylie Wells won the girls 9-10-year-old medley relay. Castronovo, Skipper, Wells and Kaitlyn Roop also placed first in the free relay as Northwood’s girls outscored Jan Ree 175-112. Melia Wells, Brooke Junker, Ella Ditchen and Ainsleigh Pack had the fastest time in the 11-12 medley relay. Wells, Pack, Ditchen and Molly Eisele won the 11-12 free relay. Junker swam on the winning 13-14 free relay with Madie Trammell, Ellie Auvinen and Kailey Wilcke. Trammell, Auvinen, Wilcke and Isabella Walker took first in the 13-14 medley relay. Grace Trammell, Rioanna Zeller, Alyssa Garvey and Ashley Hawley won the 15-18 medley relay. Paris Boyd had the fastest times in the 13-14 individual medley, free and breaststroke. Wilcke won the 13-14 backstroke. Eisele placed first in the 9-10 IM and free. Roop won the 9-10 backstroke. Zeller touched the wall first in the 15-18 IM and fly. Junker won the 11-12 backstroke. Northwood’s boys won six relays to easily outscore Jan Ree 147-48. Cameron Harrington, Jeffery Olsen, Caedmon Christensen and Grant Schaffer finished first in the 9-10 medley and free relays. Elijah Clendening, Riley Auvinen, Andrew Zeller and Conner Roop also swept the 11-12 medley and free relays. Bryce Junker, Ethan Whalen, Jackson Alt and Riley Mahoney took first in the 15-18 medley relay. Whalen, Alt, Junker and Zachary Harrington then won the 15-18 free relay. Individually, Alt placed first in the 11-12 fly, free and IM. Olsen won the 7-8 free and breaststroke. Schaffer had the fastest times in the 9-10 IM and backstroke. Zeller won the 9-10 free. Whalen touched the wall first in the 13-14 free and breaststroke. In the 11-12 division, Caleb Skipper won the backstroke and Zachary Harrington took first in the breaststroke. Junker won the 13-14 backstroke. Holiday Swim Club edged Cambridge 318-239 Thursday, thanks to another strong showing from its girls, who won all eight relays. Emma Anderson, Ella Gerig, Alex Wilcoxen and Addison Castronovo took first in the 9-10 free relay. Anderson, Gerig, Wilcoxen and Emerly Love won the 9-10 medley relay. Ashlynn Hughes, Evylyn Hales, Jaelynn Love and Maya Privratsky had the fastest time in the 11-12 free relay. Hughes, Privratsky, Erika Robinett and Kyra Norstrom won the 11-12 medley relay. Norstrom, Tessa Talento, Kassy Winters and Abby Grossman placed first in the 13-14 free relay. Grossman, Winters, Bella Beard and Alex Beard won the 13-14 medley relay. In the 15-18 division, Bella, Alex, Rosa Oliver and Kyle McCarty took first in the free relay. Talento, McCarty, Oliver and Delaney Rothmeyer won the medley relay. Individually, Hales took first in the 7-8 backstroke. Wilcoxen won the 9-10 fly and free. Emerly Love touched the wall first in the 9-10 IM. Norstrom won the 11-12 IM and free. Robinett took first in the 11-12 breaststroke. Jaelynn Love had the fastest time in the 11-12 fly. Privratsky won the 11-12 backstroke. The Beards dominated the 13-14 division, with Alex winning the free and backstroke and Bella swimming the fastest times in the IM, fly and breaststroke. McCarty won the 15-18 fly and free. Jack McCarty led Holiday’s boys team, winning the 13-14 IM, fly and breaststroke. Tony Gonzalez took first in the 13-14 backstroke and free. McCarty and Gonzalez also teamed up with Ryan Bethers and Jackson Colyer to win the 13-14 free relay. McCarty, Gonzalez, Bethers and Landon Gerig had the fastest time in the medley relay. Individually, Colyer won the 11-12 fly. Jacob Castronovo took first in the 7-8 fly and breaststroke. Jonah Strunk touched the wall first in the 7-8 backstroke. Northview lost to a deep Madrona squad 427-228 Thursday. Ana Kosiewicz won the 15-18 girls free and fly. She also swam on the winning 15-18 medley relay team with Hayley Guptill, Caraline Guptill and Sydney Epperly. Caraline also took first in the 15-18 backstroke. Kiana Staley swam the fastest time in the 13-14 IM and fly as well as the 11-12 breaststroke. Staley, Kat Kosiewicz, Anna Sponable and Sydney Smith won the 13-14 free relay. Hannah Halliday, Erin Seyfried, Miranda Guptill and Macy White took first in the 11-12 free relay. Xzavier Parker led Northview’s boys team, winning the 7-8 fly and backstroke. Tyler Barker, Michael Halliday, Will Oglesby and Dylan Guptill took first in the 7-8 free relay. In the 11-12 division, Luke Staley won the IM and Jeremy Becker placed first in the backstroke. Gavin Gasperini won the 13-14 fly.